Middle East – Celebrated lighting designer, Terry Miranda used a Jands Vista L5 console to seamlessly synchronise his elegant lighting design with media content at the recent Al Burda Islamic Arts Awards, held at the Abu Dhabi National Theatre in the United Arab Emirates (UAE). Open to artists specialising in calligraphy, poetry and music from across the Middle East, the prestigious awards are held under the patronage of His Highness Sheikh Abdulla Bin Zayed Al Nahyan and organised by the UAE’s Federal Ministry of Culture and Knowledge Development. 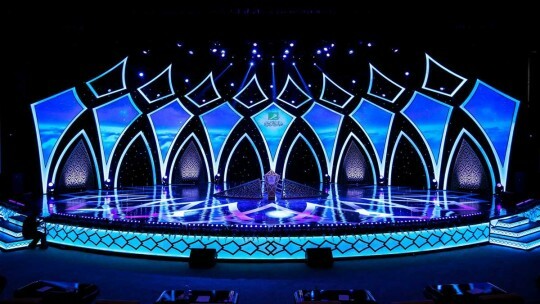 For the twelfth consecutive year, Terry – at the helm of his Dubai-based company Lighthouse Productions – was responsible for designing and supplying the awards’ set and lighting design. This year the starting point for Terry’s design was Islamic architecture – with its geometric curves, arches, complex symmetries and domed structures. The intricate calligraphy associated with individual domes was blended with a modern aesthetic. 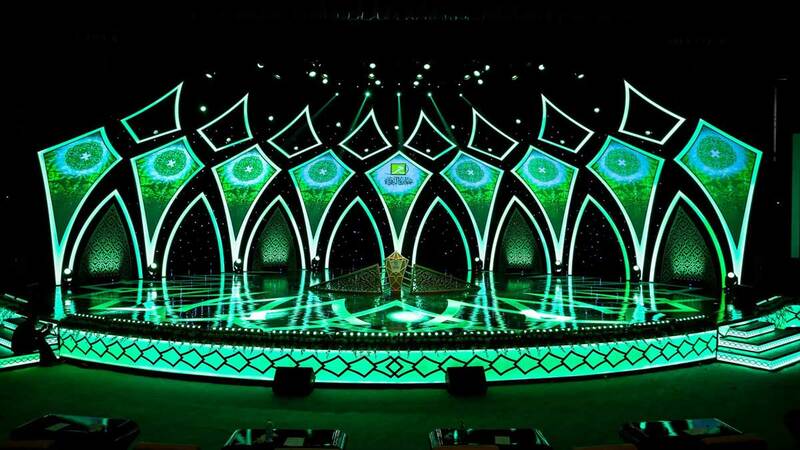 This was created by using multiple dome shapes on the set as projection surfaces, which were outlined in LED and fully mapped to receive detailed custom content. The patterning theme was also continued on the black gloss floor, so the design united all elements of the environment. Terry chose the Jands Vista L5 as his control console, so he could deftly and easily synchronise his sophisticated lighting design and the awards’ video content. Designed to cope with the complex demands of modern shows, the powerful Vista system makes controlling a mix of lighting, LED and media server technology fast and incredibly simple. “As a lighting designer who also programs, I wanted a desk built for a lighting designer rather than a programmer,” explains Terry, who is both managing director and creative principal at Lighthouse Productions. 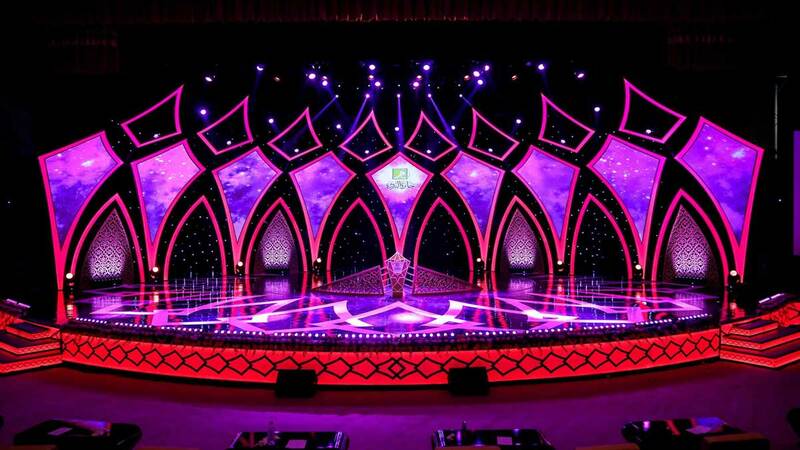 The lighting rig was kept minimal, because low weight loading in the 30-year old Abu Dhabi National Theatre is a major challenge. A selection of small, lightweight and bright Robe fixtures were selected. Nearly 100 graced the rig, including Robin 300 Beams, ColorWash 575 ATs, MMX Spots, PARFect 100s, Pointes and CycFX 8s. The awards’ programmer and console operator was Adrian De Guzman, also of Lighthouse Productions. As video and lighting were so interwoven, he found the Jands Vista L5 proved itself adept at connecting easily to the media server without triggering latency issues. The fact that our AV department also now uses Jands Vista consoles to trigger media tells you everything you need to know about the ease of learning the desk for people without a lighting background. The layout of the large screen and how reliable the product has been for us over the last five years speak volumes about its build quality,” says Adrian. Lighthouse Productions originally purchased their inventory of Jands Vista consoles from dealer, A.C. Entertainment Technologies Ltd.
Jands have been designing, building and operating lighting equipment since we made our first dimmer in 1970. Since then, our products have become a standard feature of lighting rigs the world over.